Tricel Novo sewage treatment plants provide a cost effective solution to sewage treatment and ensure compliance with Environment Agency and Building Regulations requirements. Tricel Novo sewage treatment plants are manufactured in accordance with EN 12566-3 and from one of the strongest glass reinforced plastic materials available, SMC (sheet moulding compound), the Tricel Novo is designed to be installed underground with only the air blower housing and access covers at ground level. Available in population sizes 6 – 50, the Tricel Novo can used for the majority of domestic and commercial applications. In the first stage of sewage treatment, anaerobic breakdown takes place in the primary settlement chamber. The sewage is introduced and the solids drop to the bottom, becoming separated from the liquid. The next stage of sewage treatment involves aerobic breakdown. This takes place in the aeration chamber, where masses of naturally occurring bacteria inhabit specially designed filter media. These bacteria are sustained with air, which is continuously supplied from a purpose-built air blower located in a remote housing. As the liquid flows slowly through the filter media, the bacteria feed on the waste and remove it from the liquid. In the last stage of the sewage treatment, the liquid flows from the aeration chamber into the final settlement chamber. Suspended sludge consisting of bacteria is carried with the liquid into the settlement chamber and settles to the bottom of the chamber. From there, a continuous sludge return system draws it back to the primary settlement chamber. The remaining treated liquid now meets the required standard to be safely passed out of the Tricel system. The Tricel Novo sewage treatment plants have low maintenance and running costs, and are easy to install and de-sludge. They are quiet in operation, and underground installation minimises the visual impact. 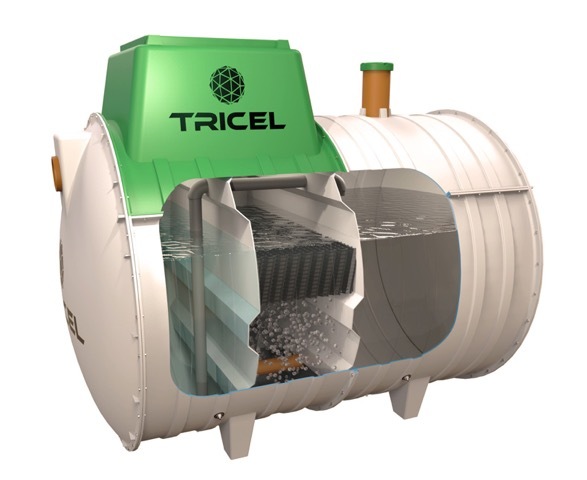 As Approved Merchants for the complete range of Tricel sewage treatment products, we are able to supply and install Tricel systems for both commercial and domestic applications. For further information or advise, contact us on 01255 853890 or complete the form below.